The new ‘MariMar’ of Megan Young and Tom Rodriguez has not been able to make an impact. Whether it’s Kantar or AGB Nielsen’s NUTAM ratings, ‘MariMar’ proved to be no match for ‘Nathaniel’. The latter series will end later tonight, but more problems await the former. Come this Monday, ‘MariMar”s new opponent will be the long-awaited adaptation of ‘Ang Probinsyano’. The new series is based on the classic late 90s film starring Fernando Poe, Jr., and will star Coco Martin in a dual role of estranged twin law enforcers. In ‘Ang Probinsyano’, Coco will play the roles of twins Ador and Cardo, whose lives were separated financially. After Ador was killed, Cardo decided to cover up the incident by posing as his brother, but playing a dead brother whose lifestyle is different from his proved to be more difficult than he thought. Joining Coco in the upcoming series will be Maja Salvador, Arjo Atayde, Albert Martinez, Agot Isidro, Bela Padilla, Joey Marquez, Jaime Fabregas, and Ms. Susan Roces. Maja will replace Angeline Quinto, who left the series due to scheduling conflicts. Also playing key supporting roles will be Simon Pineda, Dennis Padilla, Ana Roces, Zaijian Jaranilla, Malou Crisologo, Malu De Guzman, Marvin Yap, Pepe Herrera, Lester Llansang, John Medina, Michael Jornales, Gio Alvarez and Tess Antonio. Avel Sunpongco and Malu Sevilla will direct the series. ‘Ang Probinsyano’ will be the second FPJ adaptation to air on ABS-CBN, following ‘Ang Panday’ which was broadcast ten years earlier. All rights to the films of Fernando Poe, Jr. have been with ABS-CBN since 2007, and are currently seen in select ABS-CBN free TV and cable networks. Now that ‘Ang Probinsyano’ will make its long-awaited premiere, how much more will ‘MariMar’ have to endure? The series has so far not been able to live up to the standards of the original Thalia classic and the DongYan-starred first adaptation, and the entry of ‘Ang Probinsyano’ only makes things worse. That said, ‘MariMar’ will have its hands full against its new adversary. It’s a big challenge for the embattled series, so let’s see how it pans out. ‘Ang Probinsyano’ airs weeknights starting September 28 after ‘TV Patrol’ on Primetime Bida. The original ‘Pangako Sa ‘Yo’, starring Jericho Rosales and Kristine Hermosa, will always be remembered in Philippine television lore. Airing from 2000 to 2002, the series was considered the first teleserye in Philippine television. The popularity of ‘Pangako Sa ‘Yo’ forever changed the landscape of primetime television viewing in the country. Before ‘Pangako Sa ‘Yo’, primetime on Philippine television was at its most diverse, ranging from local and foreign sitcoms, action, variety and suspense programs to even animes and cartoons. However, the mid-90s foreshadowed the eventual dominance of dramas in the primetime slot, beginning with RPN-9’s ‘MariMar’ and later with ABS-CBN’s ‘Mara Clara’. Then on November 13, 2000, ‘Pangako Sa ‘Yo’ premiered on what would later become the Primetime Bida slot (ABS-CBN did not dub the primetime block as such until 2002). The series quickly made an impact, and by 2001 it was the hottest program in the country viewership-wise. The success of ‘Pangako Sa ‘Yo’ proved to be the last straw for GMA as a niche-oriented upscale network. Midway through 2001, GMA cancelled its Anime Assault (later known as Astig Authority) anime block from its primetime lineup and replaced them with their own teleseryes, a precursor of what later became GMA Telebabad. However, GMA’s own lineup of teleseryes were no match for ABS-CBN’s, and eventually forced the network to introduce the fantaserye genre, which turned the tables in the mid-to-late 2000s. ABS-CBN stuck to their tried and tested formula of traditional teleseryes, even though they briefly flirted with fantaseryes, and later introduced sexual, social, political, value-oriented and culture-oriented themes to their teleseryes. By the time ‘Pangako Sa ‘Yo’ finished its run on September 20, 2002, much of the primetime scene on weeknights, if not entirely, were dominated by teleseryes. Today, with the exception of the early evening newscasts, teleseryes are aplenty in the 5:50-11:00 p.m. window, with each episode lasting for 40-45 minutes. Fast forward to 2015, and the remake of ‘Pangako Sa ‘Yo’ will make its way onto Primetime Bida this coming Monday. The premise is virtually similar to the original, with the love story of Yna Macaspac (Kathryn Bernardo) and Angelo Buenavista (Daniel Padilla) dominating the series along with the love triangle between Amor Powers (Jodi Sta. Maria), Claudia Buenavista (Angelica Panganiban) and Eduardo Buenavista (Ian Veneracion). But like all recent remakes, the story of ‘Pangako Sa ‘Yo’ will be shortened, revised and compressed to today’s teleserye standards, with a timetable of at least four to eight months depending on the ratings. Still, fans of the original series cannot wait to revisit the tale that first captivated the nation in the early 2000s. The original ‘Pangako Sa ‘Yo”s place in Philippine television history has been secured. Now it’s up to the new version to make a similar impact. The remake of ‘Pangako Sa ‘Yo’ airs this Monday after ‘Nathaniel’ on ABS-CBN’s Primetime Bida. Not all remakes of drama series ended up airing on the same station as the original. Such was the case for three telenovelas starring Thalia: ‘MariMar’, ‘Maria la del Barrio’ and ‘Rosalinda’. The first two originally aired on RPN-9 in the mid-90s, briefly giving the struggling station a ratings boost. GMA then re-aired ‘MariMar’ in the late 2000s, while creating two local remakes of it: one starring Marian Rivera in 2007, and another still under pre-production this year. ABS-CBN never re-aired the original ‘Maria la del Barrio’, but was able to produce a remake in 2011 starring Erich Gonzales. The Kapamilya network also aired ‘Maria Mercedes’ and ‘Rosalinda’ later in the 90s. But while they managed to create a local version of the former with Jessy Mendiola two years ago, the latter wound up in the hands of the Kapuso network, not only re-airing the original, but also producing a remake starring Carla Abellana in 2009. This phenomenon is not restricted to telenovelas alone. It also happens to local dramas as well. For instance, GMA aired the original ‘Anna Liza’ starring Julie Vega in the early 80s. Then over two decades later, ABS-CBN remade the series (retitled ‘Annaliza’) with Andrea Brillantes, running for nearly a year. Another example was ‘Dyesebel’, which was remade into a GMA teleserye in 2009, only to be rehashed again by ABS-CBN last year. The former starred Marian Rivera while the latter starred Anne Curtis. Now TV5 is doing something unprecedented, as a remake of the popular GMA Koreanovela ‘The Baker King’ is expected to premiere on the network starting this Monday. That said, even Asianovelas are not safe in the said phenomenon. The original version of ‘The Baker King’ aired on the Kapuso network in 2011, and starred Yoon Shi-yoon, Eugene and Joo Won. The series earned decently good ratings for GMA that year. 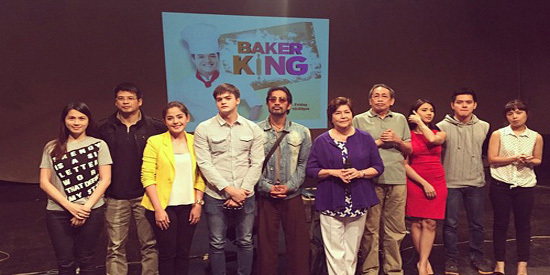 Despite the success, GMA chose not to hold on to ‘The Baker King’, let alone create a local version of it. Instead, TV5 acquired the rights for the possible remake last year. The remake of ‘The Baker King’ will star Mark Neumann, Shaira Mae and Akihiro Blanco, and will air on weeknights starting May 18 after the ‘Wattpad Presents’ series. It is rare for a drama series to have a remake air on a different station. Whether it is due to lack of revenue, loss of desire or motivation, or declining ratings, keeping the rights to a particular drama is a something TV stations cannot avoid at times. That said, it is one station’s loss and another’s gain when these things fall into place. Regardless of the result, these stations should be proud to have tried their hand at remaking these classics. After all, Philippine television is always a cautionary tale for a station’s decisions. Another local adaptation of ‘MariMar’ is now in the works. GMA recently released a few teasers that hint towards a new version of the Thalia-starred telenovela. The original ‘MariMar’ became a surprise hit in the mid-90s on RPN, and was later remade by the Kapuso network in 2007 with Marian Rivera and Dingdong Dantes. The two short teasers below were released within days of each other. It is presumed that GMA decided to make a second adaptation of ‘MariMar’ in response to ABS-CBN’s upcoming remake of ‘Pangako Sa ‘Yo’, starring Kathryn Bernardo and Daniel Padilla. Both series are expected to premiere in either the third or fourth quarter of this year, depending on the flow of the production. More information on the ‘MariMar’ remake will come in the next few months, so stay tuned.